Newton and Fitzgerald Top 10 Fantasy Quarterbacks? Don't Bet Against It! New developments occur all the time that make us stop and think about the way we go about things. For example, with the craze of 3D entertainment, a TV company has to decide whether to invest money into making 3D televisions. But before they make drastic changes, like changing their six sigma process, they should think about whether 3D entertainment is here to stay or if it's just a fad that will disappear in the near future. The same kind of thinking can be applied to fantasy football. Cam Newton and Ryan Fitzpatrick have taken the fantasy world by storm, performing at much higher levels than expected. Newton can even score double digit fantasy points while playing in a monsoon! But the real question is, can these two quarterbacks keep it up the entire season, or should you "sell high" if you're an owner of either of them? We'll do some statistical analysis with Minitab to find out! Using ESPN standard scoring, Newton is averaging 23 fantasy points per game, and Fitzgerald is averaging 21.3. Averaging over 20 points per game is fantastic for a quarterback, so let's see how often this happens. I went to kffl.com and found every quarterback since 2002 that averaged 20 points or more through his first 3 games. I stopped at 2002 because that's as far back as KFFL stats go. Here is the list of players, presented in a Minitab worksheet. Since 2002, only 21 quarterbacks have averaged more than 20 fantasy points after 3 games. And in almost every case, the quarterback wasn't able to keep up his hot start. Only 3 times has a player had a higher season average than his average through the first 3 games. I'll use Minitab's paired t test to see if this difference is significant. The p-value is less than 0.05, so we can say that when a QB averages over 20 points to start the season, his average at the end of the season is significantly lower than his average through the first 3 games. The mean is 3.8, so a quarterback's average at the end of the season is on average 3.8 points lower. So don't expect Fitzpatrick or Newton to finish the season averaging over 20 points per game. But last year Aaron Rodgers finished the season averaging 19.5 points per game. If Newton finishes this season averaging 19.2 fantasy points per game, he'll still be one of the top fantasy QBs in the NFL. Speaking of finishing the season, let's tally each quarterback's final ranking to see where he finished. Note: Final rankings are based on fantasy points per game, not total fantasy points. No games in week 17 were counted. We see that 52.4% of the time the quarterback finished the season ranked either number 1 or number 2. And 85.7% of the time, they finish as a top 5 quarterback. This shows that most of the time the hot start isn't a fluke. Sure, they don't finish with as high of an average, but they still finish as elite quarterbacks! So how can you use this to your advantage? First of all, if somebody hasn't picked up either of these players in your league, you should do so right away! But if they aren't available, maybe their owners think they are going to be smart and sell high. See if you can get them through a trade. Don't give up Tom Brady or Aaron Rodgers, but if the price is right, make the deal! And act fast! The longer these players keep up their great performance, the less likely somebody is going to want to trade them. 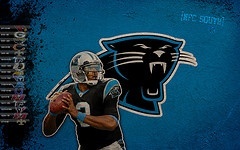 Photograph "2011 Cam Newton" by Hawk Eyes. Images licensed under Creative Commons Attribution ShareAlike 2.0.